I'm blessed to have a lot of little girly girls in my life so I've learned to make lots of little girly things. One of the most girly things I can think to make is this little tutu and fairy wand set. 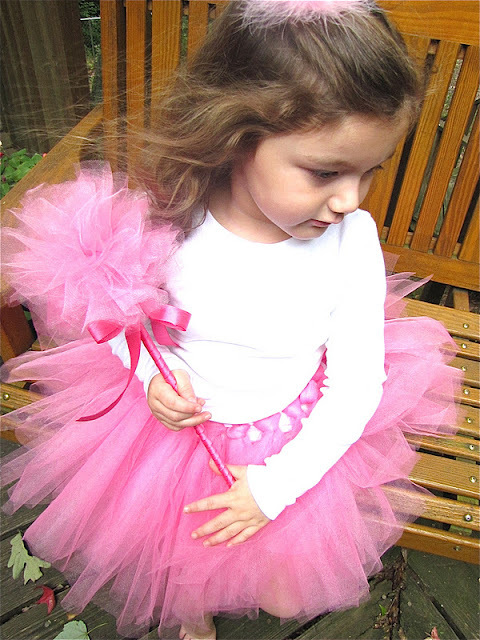 You can view the tutorial for the tutu in this post. Today I'm going to show you how to make the tulle fairy wand. You need a book, 1 spool of tulle like this one, ribbon, scissors, a dowel rod, a rubber band and a hot glue gun (not pictured). First wrap the tulle around the book 20 times or so. Then cut your tulle straight down the middle on one side. Carefully turn the book over and cut down the middle on the other side. So you'll have a pile of squares. Wrap a rubber band around the middle. Tie a ribbon over your rubber band to hide it. Don't cut off the ends of your ribbon because you will use them to attach the tulle ball to the dowel rod. Then you are going to pull out all the individual tulle pieces to make your tulle ball. 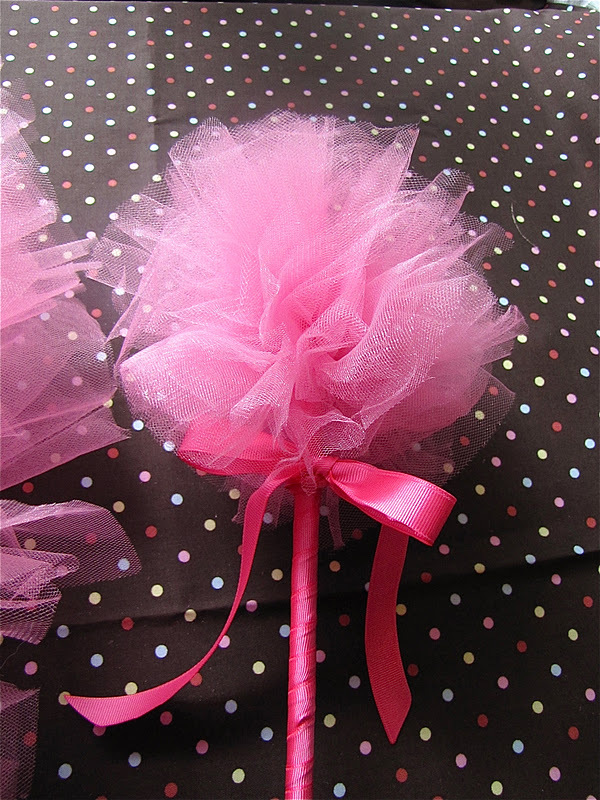 Similar to the method used for the tissue paper pom poms. So it will look like this when you're finished fluffing. For your dowel rod you cut it down to the length you want (if needed) around 10" or so. And wrap it with your ribbon of choice securing it with hot glue every so often as you wrap. 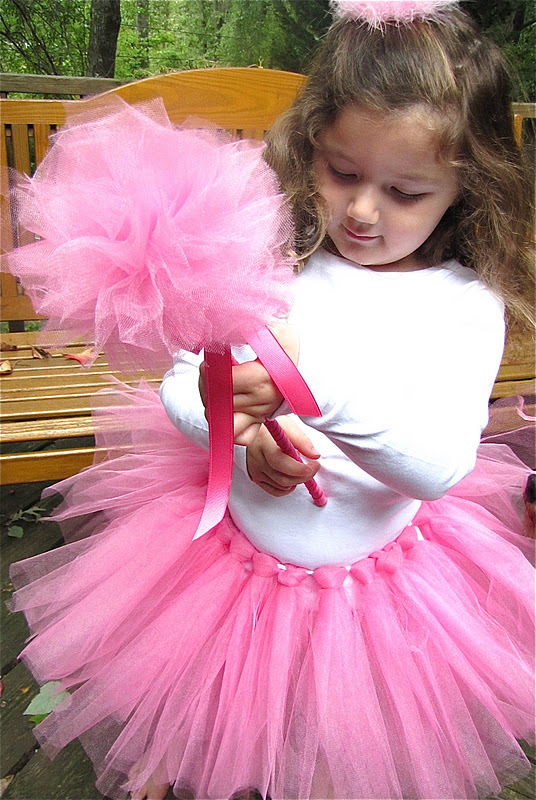 Now you are ready to attach it to your tulle ball. I forgot to get a picture of this part but you attach it using the ends of the ribbon that you covered your rubber band with. Add a good bit of hot glue to the top of the dowel rod and put it right in between the two ribbon pieces. Then wrap the ribbon around the top of the dowel rod securing with hot glue. Tie a bow around the top to hide where they connect. This would make a great gift set for a special little girly girl in your life. Linking up with The Shabby Creek Cottage, Mom on Timeout, Someday Crafts and Childmade. Super cute and easy! Cant wait to make one for my princess. This so adorable!! 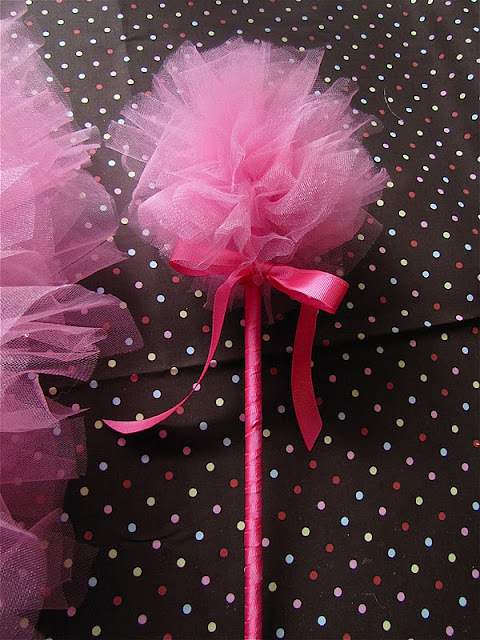 oh my goodness the tutu and the wand turned out so pretty! my daughter would LOVE something like this! I'm a new follower i'd Love if you followed back! Also thanks for this tutorial! I made one for my daughter. How cool is that little wand!!! Thanks for an easy to follow tutorial. I found The Modest Homestead via Amy at A Home Made and am your newest follower. I love your DIY wand! I didn't know it would be that easy to make one. Thank you for this. I'm trying a few ones for my little girl's first birthday. Thanks so much! I hope your little girl's birthday turns out great!! just love the wand and have made one for a wedding with pretty flowers and a beaded hart on top .Thanks for shareing with us and just lovely . Thanks for the tutorial. I have one question. Does wrapping the book 20 times mean all the way around is one time (from front to front), or just half way around (from front to back)?